In 1981, then DeKalb County Sheriff Wilbur B. Scott, proposed a design for a new “County Seal” which depicted the wealth of DeKalb County’s resources. The County Board subsequently adopted this seal as the official County seal. The center of the seal is divided into four sections with two outer rings surrounding the seal’s center. The upper left quarter represents Agriculture and the Rural Community displaying the many contributions to the Nation’s agricultural needs. In the foreground of this quadrant stands a stalk of corn, representing the County’s leading crop and a noted hybrid developed locally. Also depicted is a heifer steer representing it’s beef industry. An old wind mill and red barn of the past can be seen in the background along with the familiar blue silo, manufactured by one of the local industries. This section is a tribute to DeKalb County farmers. The lower left quarter is symbolic of DeKalb County’s commitment to the Nation’s Future through Education. The foreground illustrates a scene from the past (the little red country schoolhouse) and on the horizon, Altgeld Hall the “Castle” of Northern Illinois University. A diploma and graduation cap represents the thousands of students educated and able to make the decisions of the future. This section is dedicated to the educators, senior citizens, and the youth. The lower right quarter represents the numerous recreational facilities in DeKalb County that are available to it’s residents and visitors. The County Forest Preserves, Community and State Parks offer swimming, boating, fishing, hunting, camping, hiking, picnicking, band concerts and magnificent fireworks displays, not to mention a large variety of competitive sports. Depicted in this scene is a lone fisherman doing battle with the famed “fighting tiger muskie” of Lake Shabbona, the largest fish in the County. At the bank of the lake a tree line is shown, portraying one of the County’s numerous Forest Preserves. This section is dedicated to the value of the community’s natural resources and quality of life. 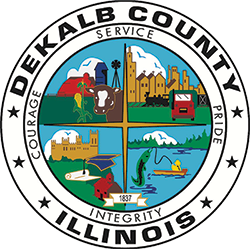 At the bottom portion of the seal is a banner displaying the year 1837, which was the year DeKalb County was founded. (March 4, 1837). In the narrow circle surrounding the four quarters are the words: Service, Pride, Integrity, and Courage. These words are reflective of the commitment employees strive for in their service to the citizens of DeKalb County, IL.